I’ve been to Tokyo Disneyland and Disneysea a number of times, and every visit involves a lot of eating. 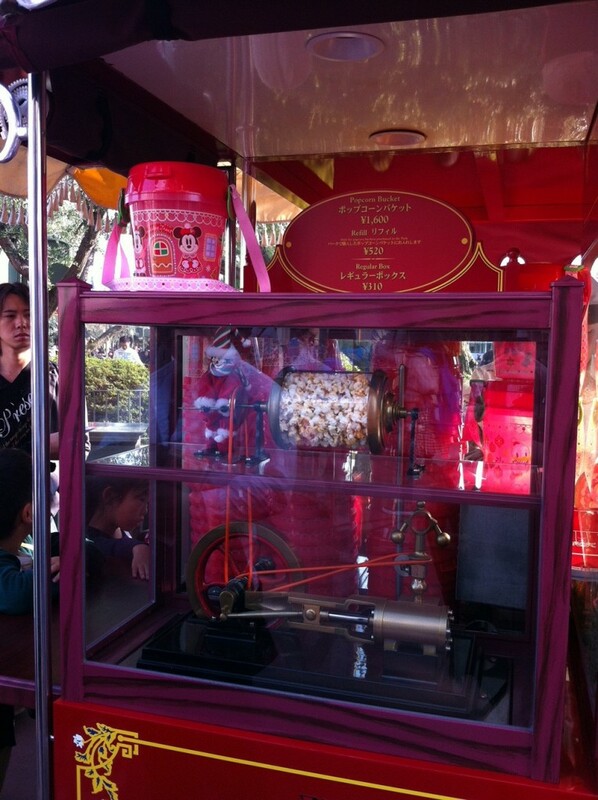 One of the best snacks you’ll find at Tokyo Disney Resort (TDR) is the popcorn which comes in many, many flavors. I’ve tried at least 11 different flavours (possibly more – I wasn’t counting when I first began), so I’ve put together a list of these 11 popcorn flavours, along with my ratings, with five stars being the highest rating. Curry, corn potage and milk tea (all available at Disneysea) are my absolute favourites and are on my must-have list every visit. Curry is located near at entrance to the Arabian Coast, corn potage at the American Waterfront and milk tea in Cape Cod. Honey and caramel are almost as good and came in at a very close second place to my three favourites. Black pepper (not too spicy), white chocolate and chocolate are all good, but they’re a little less exciting, and with the chocolate flavours, I often find that they don’t have enough chocolate on them. I like my chocolate popcorn to be pretty chocolatey! Soy sauce is quite nice too, but again just isn’t quite as exciting as, say, curry popcorn, and salt popcorn is as good as any salted popcorn that you’ll come across. The only one that I’ve found to be a huge let down is the strawberry popcorn. 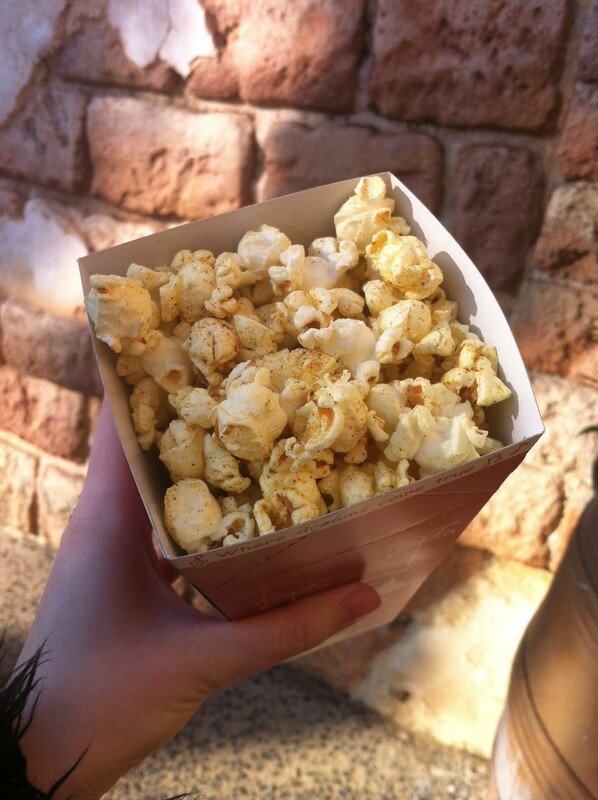 I’ve read this on another blog at some stage too – the strawberry popcorn smells incredible. It smells like it should be the best popcorn you’ll ever taste. The problem is that the taste doesn’t live up to the smell. It’s sweet, it’s nice, but it’s nothing special. If only it tasted as good as it smelt, but on the bright side, there are so many other great flavours that it hardly matters. 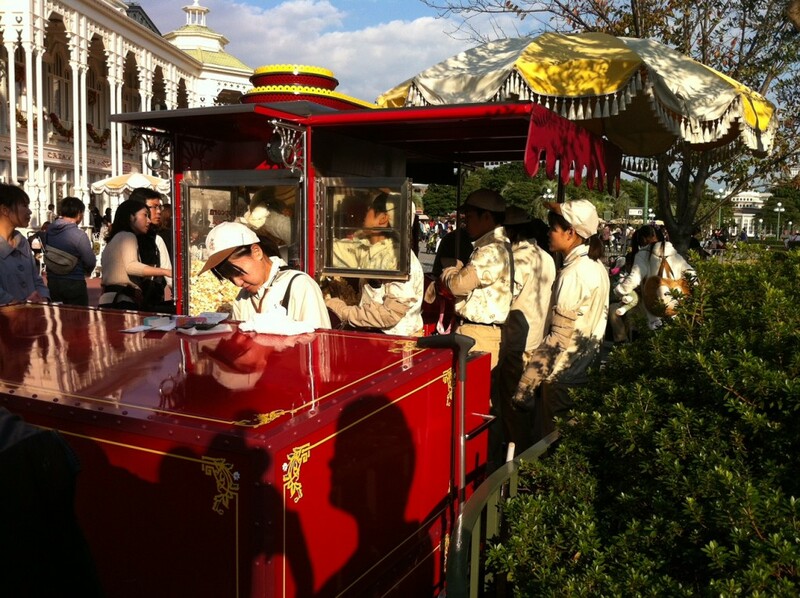 Popcorn wagons are located throughout both Disneyland and Disneysea. Some flavours can be found at both parks whilst others are unique to a particular park. Certain flavours are limited, so if you’re planning a trip to TDR, I recommend finding out which ones are limited and making a point of trying them while you can. When you arrive at each park, they give you a map and amongst other things, the map will show you where each popcorn wagon is located. You can buy popcorn either by the box of you can buy it in a souvenir popcorn bucket (a large novelty container which you can wear like a bag so you’ve got your hands free). Like the popcorn itself, the souvenir buckets come in several varieties, some of which are limited (for example the Little Green Men in Christmas gear). Souvenir popcorn buckets can be refilled, and they’re larger than the disposable cardboard boxes. This means of course that a refill costs more than a box. I prefer to buy popcorn by the box because I’d rather have less of each flavour and be able to try more flavours (whilst also saving money). If, on the other hand, you have a bigger appetite and want to save a bit of cardboard, the novelty souvenir popcorn buckets are pretty good. Every time I go to TDR, I am tempted to buy a Minnie Mouse bow-shaped one. 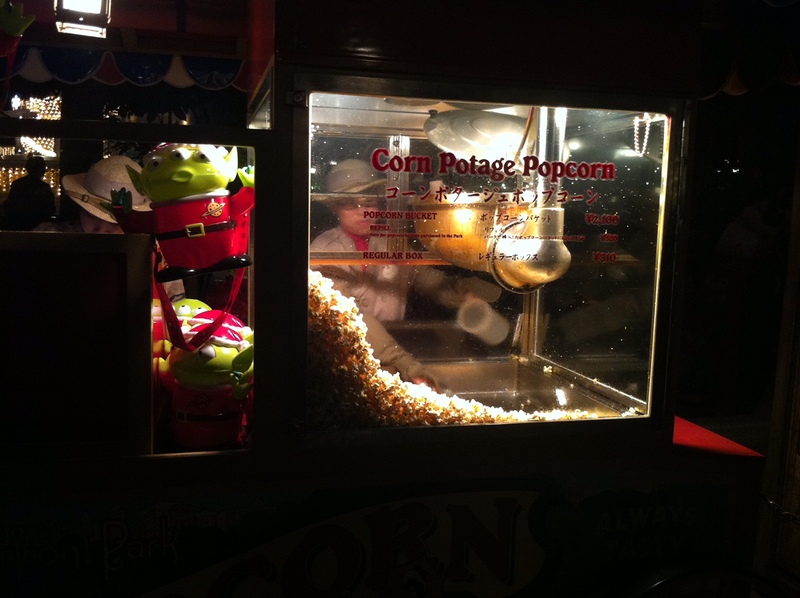 Popcorn wagons are decorated to match the theme of the areas that they’re located in. 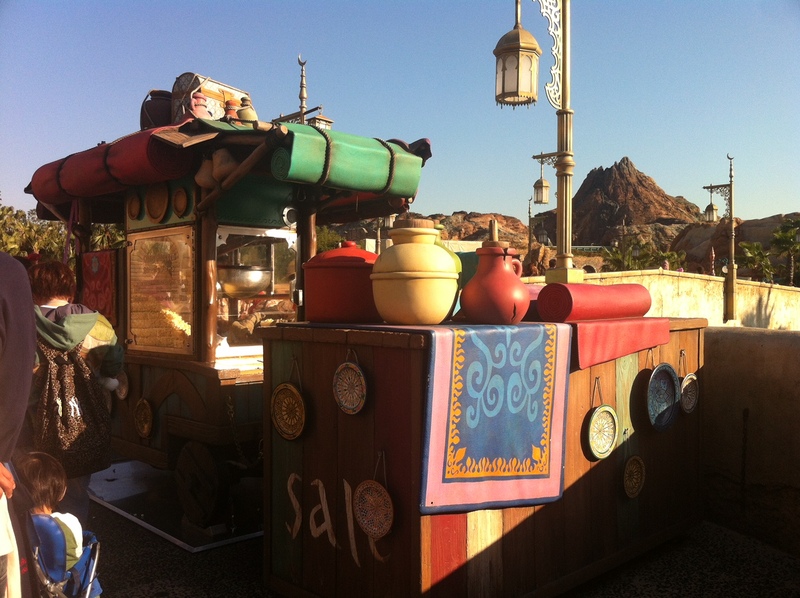 Below is the curry popcorn wagon near the Arabian Coast at Disneysea. At least five cast members attend to a popcorn wagon at Disneyland. They take great care of the popcorn wagons (as they do every aspect of TDR) and constantly keep them clean and well stocked. Christmas themed Minnie Mouse souvenir popcorn buckets. Note the difference in price for the buckets, refills and regular popcorn boxes. 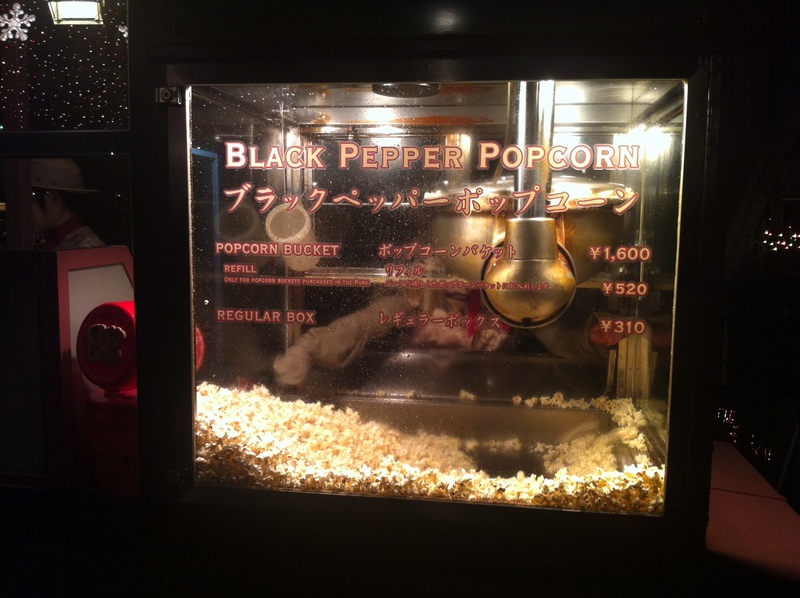 That’s 1,600 Yen for the popcorn bucket, 520 Yen for a refill, or just 310 Yen for a regular box.